One of the most powerful families in the country is that of the Rawlings. Former President J. J. Rawlings is the longest-serving Head of State in the history of the country, with a number of landmark achievements to his credit. But he is also criticised for certain decisions taken under his 18 years of revolt and revolution, as well as democratic governance. His wife, Nana Konadu Agyeman-Rawlings, on the other hand, is the longest-serving First Lady and leading advocate of women’s empowerment in Africa. As is to be expected, issues concerning the family are topical in the country’s political discourse. 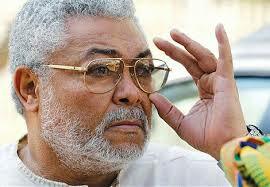 Former President Rawlings has been a lead crusader in anti-corruption issues. Recently, however, there have been media reports that he took a gift from late Nigerian President Sanni Abacha. When the news broke in the Nigerian newspaper, the Guardian, the Political Editor of the Daily Graphic, Mr Kobby Asmah, decided to contact former President Rawlings to throw some light on the issues. After back and forth movements spanning some few days, he agreed to grant the interview. The appointed date and time could not be confirmed until one fine morning when the former President decided, through a telephone call from his Press Secretary, to engage the Daily Graphic Team. The team got to his residence before the appointed time to go through the necessary protocols. When he opened his private office to us, and the ‘huge tall frame’ of a personality welcomed us to a two-hour interview session, it was not devoid of the ‘Papa J Character’ reminiscent of his days as the Head of State of Ghana. “Have you read what they have written about me? It is nasty eh?” the former President asked, unexpectedly. Then the former President plunged into action. His emotions, gestures, confident-looking postures, demeanour, articulation reminded the Daily Graphic Team of his heydey at the helm of the affairs of state engaging with Ghanaians on how to build a country of promise. I had expected to ask questions, but very characteristic of him, the former President decided to walk us through a lecture touching on his days as head of state (military and civilian), some of the difficult and sensitive decisions he took, his observations out of political office, Ghana’s present political scene, the challenges confronting the Ghanaian media and finally the issue at stake. The much-anticipated interview had long begun when I started firing my questions on governance in the country, the 2016 elections, his role in the ruling National Democratic Congress (NDC) and many other issues. No doubt there were “booms” as usual. Do you sometimes miss the Office of President, Sir, having been the longest serving Head of State of this country? I don’t. At the same time, it is sometimes burdensome that I do not have the resources and executive authority to deal with the worrisome issues and pain on the ground. My office has to deal with people with hardships including their inability to pay school and hospital fees, rent and funerals. Where else can they go? I am uncomfortable taking donations and contributions from people to support other needy people, but what can I do? Thankfully the Presidency, various personalities and organisations chip in once in a while. What in your opinion must we do to permanently solve or minimise what you describe as the pain on the ground? JJR: What is long overdue is the setting up of a foundation to cater for some of these humanitarian needs. The burden is too much. Ten years of being at the centre of revolt and revolution and eight years of constitutional rule with some treacherous characters in the leadership can also be quite stressful. Sir, can you please share with us your key focus while in government, being at the centre of revolt and revolution and eight years of constitutional rule? We did not go into government to make money or business. Because of that, we ran a corrupt-free administration. The key focus was to identify competent human resource to manage relevant institutions in a competent and efficient manner. In effect, I spent 30-40 percent of my time watching out for corrupt or indications of corruptible behaviour. Many choose to blight our record, but we revived the financial health of the country and left Ghana in good stead for sustained economic growth. Ghana goes into her seventh elections on December 7, this year. There are uncertainties, anxieties, mistrust and suspicion all over the political environment. How do you see the political climate preceding the presidential and parliamentary elections? What should all stakeholders do to ensure free, fair and peaceful elections? I have indicated before that all stakeholders; particularly the leading political parties, have to ensure that as they campaign they do not employ aggressive and abusive political rhetoric that tends to raise the political temperature. Leadership of political parties should rein in communicators and other supporters who resort to mudslinging, abuse, false accusations and insults in their quest to denigrate their opponents. It is also imperative that the security agencies are seen to be firm and impartial in their handling of complicated political situations, while the media should desist from allowing their mediums to be hijacked by politicians for negative politicking. If all the stakeholders – political parties, media, the judiciary, security agencies and the Electoral Commission (EC) play by the rules, the process will end successfully, and all will accept the eventual winners. Your views on corruption are globally known, but what is this revelation that you received money from one Gwarzo from Nigeria, 18 years after the matter had died? We have allowed the $5 million lie to run, when it was $2 million. I am tired of falsehood and liars all over the place. With the pile-up of lies and fabrication, I wanted to set the record straight once and for all. That money did not go for my personal use and was not meant to influence me to whitewash Abacha’s image. My credibility is priceless and cannot be bought. My compatriots have always been nervous when I am about to speak, no matter how close I am to them! General Abacha was unassuming and carried the determined pride of a Nigerian. His intervention during the uncertainties around Shonekan’s period was very timely and kept the centre in Nigeria together. He obviously respected the integrity of our leadership and chose to support us without prompting or being asked. How was I to know he was engaging in stashing huge funds? Didn’t we all hear about this negative behaviour after he had died? Incidentally, Nigeria used to make the most contributions, I believe, to the ANC struggle. I cannot stifle the truth. Jerry Rawlings never stifles the truth no matter how long some attempt to suffocate the reality. Gwarzo should not have done what he did. Not against me. We survived and succeeded on the incorruptibility of the word. This nation exploded once over corruption. Being socialist minded as I thought we were, our focus was to turn around most of our state enterprises, and we had no time or interest in promoting business for personal profit, as a result of which we hardly had any money to engage in the neo-colonialist struggle. I never declined support from progressive-minded leaders because we all knew the nature of the struggle we were engaged in. Not one of my colleagues in the PNDC/NDC can accuse me of misappropriating funds for my personal use. Sometime in 1982/83 a Pan-African wealthy admirer of our revolution flew in to meet me; after exchange of views; before he departed, he signed a cheque for $1 million. After his departure, I picked up the cheque and tossed it onto the workshop table in the bedroom at the Castle with one of our security comrades following me. About seven to eight years later, this comrade was asking about the cheque and the need to cash the money for some project. Having forgotten about it, I asked if he had any idea where it could be and he said I tossed it onto the workshop table so I asked him to go look for it. He found it and attempted to cash it but there was no money. I asked him to call the donor so I could enquire what had happened to the money. The gentleman explained that after about six months of the money sitting in the account, he thought we had no need for it so he took it back. When Mandela was going round the world soliciting for funds and he came here for support we were privileged to contribute $1 million. Can this contribution be called bribery? Mandela was fighting apartheid, and our revolution was fighting neo-colonialism. Governments and organisations, as well as individuals all over the world, will either support you or support an opposition against you depending on whether you are perceived as being progressive or reactionary. There are those who put these kinds of support into their private pockets and accounts while there are those of us who receive for patriotic and humanitarian purposes and to continue the neo-colonial struggle. And this support takes various forms; logistical, political or financial. What do you think Russia is doing in Syria supporting the regime while America is supporting the opposition to wage war against the regime? What is Saudi Arabia doing in Yemen and neighbouring countries? This kind of support for or against goes on everywhere all the time. Denying it does not mean it is not happening. Very well sir, but what was the exact purpose of this money? Was it something you solicited? Did you appropriate a portion for your personal use? As I indicated earlier, it came without prompting or solicitation. We received various forms of support from leaders of government and other well-wishers in our continued fight against neo-colonialism. If I had gained personally in any way, or if I had been stashing money from such contributions, I would not at the end of my tenure, have been in search of $28,000 for a close family member’s surgery when the incoming government refused to approve the medical cost. I was compelled to borrow the money for the surgery. I have been compelled to borrow much bigger amounts to support a lot of our compatriots who have been through painful situations as a result of the persecution they suffered after we left office. There have been a lot of reactions since the revelation. What is your response? Has this revelation rather punched a hole in your quest for leadership of integrity? Mr Hackman Owusu -Agyemang, a former Foreign Minister under former President Kufuor’s administration, says you should go and sin no more. What is your reaction? As for Hackman Owusu-Agyemang’s comments, what I have to say is that God will approve of my sins so far as they’re directed at people of his ilk. Man’s quest for power through corrupt means will push them into attempting to destroy people of integrity. Some societies jail people for lying, but here liars and thieves have gained the upper hand. But not over me. The truth for me is divine. Uniqueness, excellence and godliness cannot be without truth. If we are looking for something negative to believe about Rawlings, then go search for something else. If we are, however, as weak and faithless as to want to believe a dirty charge of bribery and corruption against me, then evil has triumphed. My unshakable integrity has served a noble purpose almost all my life. The neo-colonialism struggle is not over and people cannot afford to lose the dignity and strength of their integrity. You need it to continue the struggle against neo-colonialism and the destructive effect of bribery and corruption. This orchestration is designed to weaken your belief in Rawlings and most of all in your very own self. You need an incorruptible degree or quality of strength to fight this evil and you need your integrity to fight a good fight. I find it laughable that some have used the media to try to rationalise and even speak almost as if they know the facts more than I do. What could be the explanation for the media stoking this issue to this extent? My reputation and image presents a huge challenge and obstacle to bribery and corruption, so if the media can be used to create the impression and convince people that I am corruptible, this would change the paradigm and destroy the factor that makes Rawlings a very potent force. If the people should begin to have doubts about my integrity on account of this falsehood, our enemies and traitors would have won. For them to misinterpret a contribution or support in our fight against neo-colonialism is quite disingenuous. A few too many characters in the media earn their living this way. Destroying the integrity of Rawlings has been the main objective since 1979 to this day. Newspapers and other characters have been set up and financed with this objective as the main goal. This brings me to the issue of your view on political discourse in the country. Do you follow general discussions on our airwaves, print and social media? If we are going to allow some of these self-acclaimed media analysts to influence our perspectives about what is true or false, right or wrong then we will continue to have difficulties with rising above mediocrity, petty-mindedness and prejudicial thinking. Our sense of cultural justice and basic intellect is being seriously warped by some of these characters. Let us free ourselves, let us disentangle our minds from the daily barrage of shallow and hollow rhetoric on our airwaves. Let’s not allow our resolve against bribery and corruption to weaken. That is the clear aim of these characters. They feel threatened by anyone with higher morals than they have. When I got that financial award from the Hunger Project did I not use it as seed money for a university? Is this not what I do, is it not my nature? I will not tolerate or permit any such thing. My mind is nowhere near materialism. Let me assure the numerous people of my solid faith here in Ghana and beyond that my integrity is intact and unshakable. I cannot force belief on anyone. If some do not know who I am…the quality of my integrity by now, there’s little I can do to help them. Maybe, when the carrion eating vultures and truth haters have had their fill, reasoning minds and hearts will prevail. Questions have been raised about your role in the NDC. As party founder you have criticised the party publicly and recently referred to the NPP candidate as not being corrupt. Do you still support the NDC? Do you know the number of times Justice Annan kept reminding me that he belongs to the UP/PP tradition during the PNDC era? And yet I remained a great admirer of Justice Annan, his brilliance, his diplomacy, his sense of fairness and the quality of his judgement. Justice Annan was one of the finest statesmen of integrity that I have come across and gave his best to this country as most of us attempted to do. Justice Annan would indeed have been a very fine President. I will therefore, not misjudge NPP on account of some of its callous, vicious elements just as I will not disown or misjudge the revolution, the PNDC and the NDC as some of its appointees and leading figures have done in dissociating themselves from the PNDC, June 4 and 31st December. Treachery and disloyalty is not my nature. Some within the party have turned themselves into kingmakers who will do all in their power to upstage the party structure and operate the party from their homes. My criticisms of socio-political issues have not been restricted to the NDC. When I was very critical of the Kufuor government and his party I was then in the good books of the NDC, but today after eight years of NDC whom do I criticise? Naturally, I will criticise the party that has been saddled with the responsibility to manage the country. I sometimes echo the opinions of the voiceless and I do so with goodwill. I do so to ensure that the party and its government stay on their toes. My role as Founder should not be a basis to suffocate my conscience. The NDC is undoubtedly a formidable political force borne out of a revolution that many laid down their lives for. Our responsibility is to every man and woman who sacrificed with their blood and toil during those heady days. Failure to adhere to the principles of probity, accountability, transparency and integrity will be a betrayal of those who sacrificed for this nation. Many including the global community are expecting to read your memoir. Sir, how come we do not have your memoir written and published by now? My memoir will be out by my 70th birthday and the title will however be shocking but true.